When powered by an external 12V dc low noise supply, this Low Noise oscillator stays cool at 7W consumption. When mounted internally, without forced air cooling, this small module on PCB (without enclosure) measuring just 95.5 x 60 x 37mm is easy to accommodate in a 2U or 1U case. Mass: <300 grams. Volume: 15cc. A clear cost / benefit can be demonstrated at the highest end of frequency control applications. A reduction in background noise in a system, by employing low noise rubidium, enables enhanced surveillance and monitoring performance, signals will be heard where previously "lost in the instrumentation's own noise". Put simply, reduced close in phase noise and jitter enhances any security establishments’ capability, to raise the sensitivity of reception, at a tiny fraction of the monitoring equipment cost. 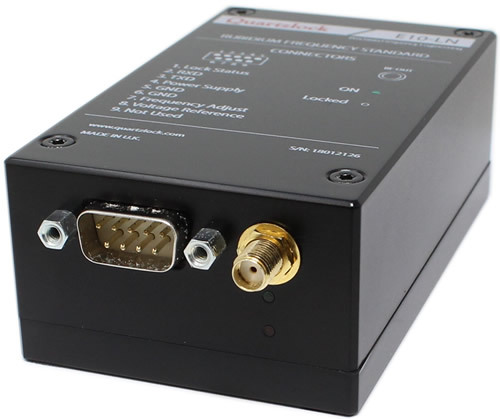 As a reference for Spectrum Analyzer, signal source, direct digital synthesisers (DDS), Vector Noise Analyser (VNA), panoramic adaptor, modulation analyser and other quartz clocked products, a Low Noise Rubidium oscillator will reduce drift, synchronise all instruments to the same frequency and reduce phase noise. The Quartzlock "brand" is a "Promise of Innovation", advanced design and excellent service. The E10-LN embodies this promise. A low noise miniature, low cost, rubidium oscillator module that maintains the high frequency & time accuracy required for demanding applications.